When picking a horse to back for the Grand National, many times the form book goes out of the window. This is often the case with ‘once-a-year’ punters preferring to keep things simple. These punters often opt for the best-looking jockey silks or even side with their favourite colours. If you follow horse racing, you’ll know that the colours a jockey wears won’t impact the chance of winning. If you’ve studied the form, you won’t care if the jockey is wearing pink polka dots on his silks. Here’s a little more on Grand National colours. Grand National Colours – Why do jockeys wear different silks? The Jockey Silks Are To Help Commentators and Punters – The main reason why jockeys wear different colours is so punters (and the race commentators in the modern era) can tell the horses apart. The Jockey Club first introduced jockey silks in 1762 after many racegoers complained that they didn’t know which horses were which. 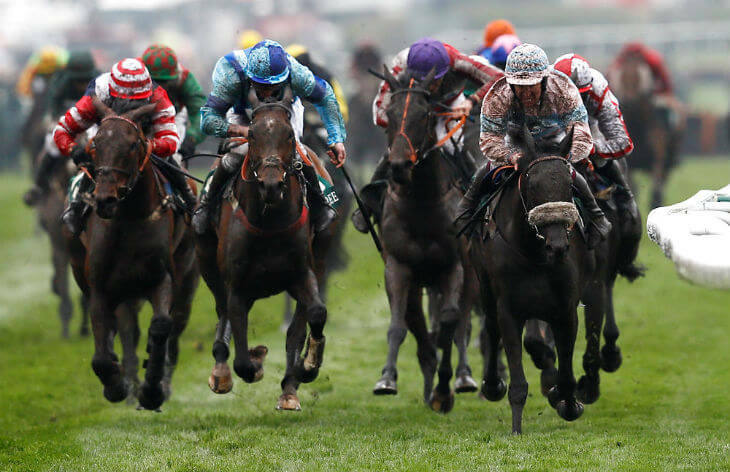 Imagine having 40 horses in the Grand National and all jockeys are wearing black. You’d be none the wiser if your horse was winning, fallen or in the last place! What Do Grand National Colours Mean and How Are They Chosen? In the early days of jockey silks, the Jockey Club introduced plain colours to keep things simple. But in the modern era, there are hundreds of different styles and colours, plus some more recognisable than others. The silks are actually associated with the owner of each horse and not the jockeys. Therefore, if a jockey has 6 rides at a meeting on a particular day there is a good chance they will be getting changed into new silks for each race. Once an owner registers his colours with the jockey club then each horse they own will run in those colours. What If The Same Owner Has More Than One Horse In The Same Race? It’s actually more common than you think. Yes, the business of owning a racehorse is an expensive one. But there are also a lot of very wealthy owners in the sport that have a whole string of horses. Therefore, there is every chance these big owners will have more than one runner in certain races – so what happens? It’s simple, they just change the colour of the cap. So, they will run with the same main silk colours (design). But depending on how many horses that the owner has in the race, each jockey will wear a different colour cap so punters can still tell them apart. The jockey wearing the original colour cap will generally be thought to be riding what the owner thinks is his best chance in the race. But it doesn’t always pan out like that – after all this is horse racing and anything can happen! A recent Grand National example of this would be in the 2016 running of the race as the eventual winner – Rule The World – who is owned by one of Ireland’s biggest owners – The Gigginstown House Stud. They actually had three horses in the 2016 Grand National – First Lieutenant, Sir Des Champs and the winner – Rule The World. However, the winner was actually wearing a blue cap (not the original first choice maroon star), or even the second string white cap that Sir Des Champs wore. The other main jumps owner that punters will recognise are the green and gold horizontal stripes of popular Irish owner JP McManus. He’s won the Grand National once before (Don’t Push It, 2010), and actually had four runners in the already mentioned 2016 Grand National. So, 17.5% of the 40 runners that year were owned by either McManus or Gigginstown! Are There Any Lucky Grand National Colours? With 40 runners heading to post each year then it’s not really the kind of race you see the same horse winning – after all the last horse to win back-to-back Grand Nationals was the mighty Red Rum in the 1970’s. However, whereas we’ve not seen a repeat winner for over 40 years, we have had an owner that’s won the race three times since 2005! Step forward – Trevor Hemmings. His famous green and yellow quartered silks were worn by the 2005 winner – Hedgehunter, the 2011 hero Ballabriggs and most recently in 2015 by Many Clouds. All three were trained by different stables too as Mr Hemmings likes to spread his horses around. Hedgehunter was trained by Willie Mullins in Ireland, while Ballabriggs was for Donald McCain and Many Clouds gave trainer Oliver Sherwood his first Grand National winner. Over the years, whether you are a ‘once-a-year’ punter or not you will start to remember certain Grand National colours popping up year-after-year. We’ve already mentioned the big owners like Trevor Hemmings, JP McManus and Gigginstown House Stud so racing fans will always latch onto horses that are running for these powerful owners. However, some Grand National bets will simply be placed on a horse that has a jockey wearing a set of silks that stand out, or even a favourite colour. The same rule applies to certain names of horses with non-racing fans latching on to memorable names that might have a connection with their own lives. If your favourite colour is pink and you spot a horse with a jockey wearing pink then there is every chance you might be drawn to that runner. Once an owner has a horse that makes the final 40 runners in the Grand National his next job is to find a jockey that will ride it. It goes without saying – just like in any sport – the top jockeys with plenty of experience, or ones that have ridden winners in the race before, will be hot property. However, some jockeys don’t get much of a choice. Big owners – like JP McManus – might have what’s called a ‘retained jockey’ and this means that jockey will ride all their horses. Yes, if – like we’ve mentioned – that owner has a few horses in the race then that retained jockey will have a choice to make on which horse to ride – and they don’t always get it right! Grand National Colours - Why do jockeys wear different silks? What Do Grand National Colours Mean and How Are They Chosen? What If The Same Owner Has More Than One Horse In The Same Race? Are There Any Lucky Grand National Colours?